Butler, Party of 4: #babybutlernumerodos is 40 Weeks!! Well, Kade has officially made it in utero longer than Jase! 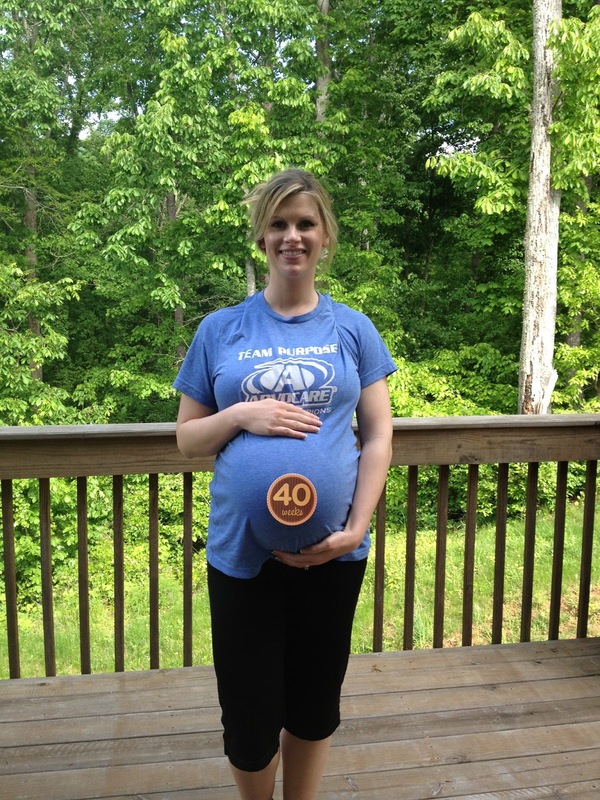 Jase had a 40 week & 1 day gestation, and we are wrapping up 40 + 1 as I type this post. Growth: What even is a jackfruit?? My Symptoms: My hair has been growing crazy fast. I seriously have to shave every day and even though I just got my hair done a few weeks ago, my roots are already starting to show. I also got a gel manicure & pedicure for maternity pics a couple weeks ago, but both of those are donezo now too. I have zero swelling, rings still on, and actually still feel REALLY good. Like, “if I didn’t have this huge torpedo belly I wouldn’t even know I’m pregnant,” good. I know that is definitely a blessing and I am super, super thankful the Lord has blessed me with such a great pregnancy. Lost some of my mucus plug on 6/11 & even more on 6/12. (FYI: There are just some things you shouldn’t Google when you’re pregnant. Images of mucus plug is definitely on that list. Bad move. ) Sorry, I know it’s TMI but I want to document. Also having some contractions but nothing consistent or intense enough to monitor. They definitely pick up at night time (and slow down during the day) and my abdomen gets superrrrr tight. I can also feel some pressure a little lower, but again, nothing to get excited about yet. Weight/Baby Bump: Down a pound or two at my last appointment. (That happens towards the end when the amniotic fluid starts decreasing.) That puts me up around 23 lbs or so. My belly is way more impressive in person though. And everyone keeps joking that my timer says done, but I’m pretty sure that joker popped out when I peed on the stick back in October. Ha! Gender: Sweet little fella. Any day now…Oh, how we can’t wait to have you in our arms! Maternity Clothes: Yep. I can only find one tank top that fits right now (I’m using the term “fits” very loosely- that might be pushing it) so it’s getting a lot of wear. Like daily. Because it’s hot and we spend a lot of time outside. I tried on a few of Jonathan’s cut off tees, and I seriously looked like something you would see on a reality tv show (and I don’t mean that in a good way), so I decided to stick with ole trusty. Sleep: Sleeping well. I am definitely well rested and have been taking great naps during the day too to make sure I’m ready for labor. Movement: He’s still moving around in there, but it is some majorly cramped quarters. I can’t really feel it from the inside anymore because my tummy is so tight, but I can see it and feel it from the outside. 6/9 appointment (39 & 5): Blood pressure was 118/71. I was almost 2 cm (a good 1 1/2) & around 70% effaced. I can’t remember what station she said but he is low & my cervix feels pretty soft & favorable. 6/12 appointment (40 & 1): Blood pressure was 109/66. I was about 2 1/2- 3 cm dilated. We did an amniotic fluid test with an ultrasound (11, which was in the normal range) and she guessed he is weighing right around 8 lbs & 4 oz. We saw some hair & a big foot (shocker, huh? ), and also that he is head down and face down in the position he should be in. Praise the Lord! That was music to my ears. We also sat on the monitor for 20 min to watch his heart rate and contractions. He went to sleep for a few minutes, so when they woke him up he showed great accelerations. Basically, all is healthy and well and the doctor was still positive and encouraging about VBAC. If I haven’t had him by Tuesday, I’ll go back for more monitoring and we’ll start talking about options then. Super thankful for a great staff who has been incredibly encouraging and supportive of our desire to VBAC. Things I’ve Tried to get Kade here: Lots of fresh pineapple, eggplant parmesean (4 times, even from Scalini’s), reflexology, lots of walking, lots of bouncing on an ab ball, lightly jogging stadium stairs (which II ‘m SURE was quite a sight), and even acupuncture. Yes, old needle phobia over here got desperate. Oh, and a few others that shall remain nameless but are said to work. Other than the few internal things that I’m not going to try, (red raspberry leaf tea, evening primrose oil, and castor oil) I’ve tried pretty much every old wives’ tale there is. We also had a snake in the basement this week (thank you Turtle Man for catching it for us), so that was eventful. Got my heart rate up for sure…I do NOT do snakes. But no baby. Just proof that babies are meant to come in God’s timing, right? Best Pregnancy Moment This Week: I had an appointment this week and the sweetest old man stopped me and asked if he could pray for me and the baby. It absolutely filled my heart- so, so sweet! And he was so genuine & heartfelt. It was such a great reminder to just TRUST! I also know we are being covered in prayer by so many friends and family members right now, and I just can’t even tell you how much that means to us. I am so beyond thankful for every single prayer that has gone up on our behalf & could cry just thinking about it. Thank you, LORD, for surrounding us with such godly friends and family. Work Outs: This week I went to yoga, went on a few walks, and did arms one day at the gym. I celebrated my actual due date by jogging up and walking down stadium steps at the local high school track. Goals: Welcome a healthy Andrew Kade to the world! 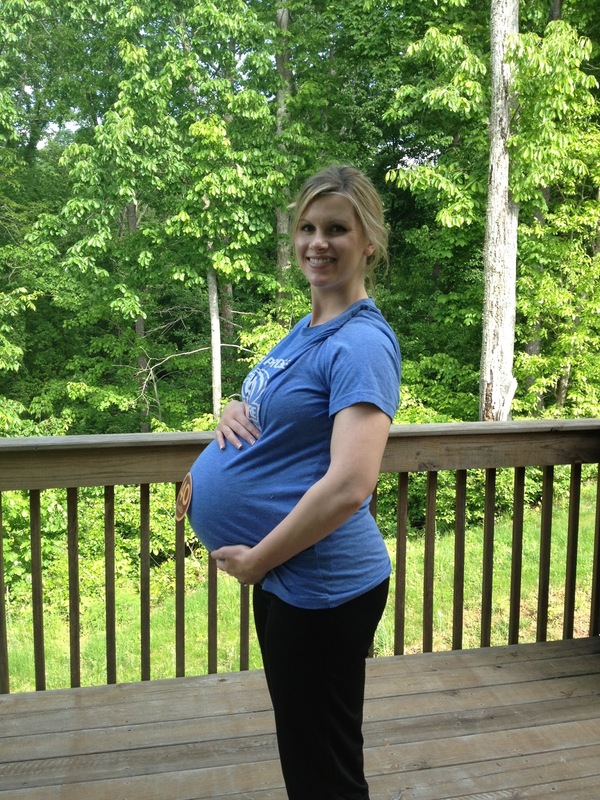 My favorite question right now…”When are you due?” My response: “Ummmm, now?” Ha! (And now it is… “Yesterday.”) I have really tried to stay on top of pregnancy hormones & not let them make me act like a brat. There is really no excuse for that (because I’ve been on the receiving end and it is realllllly NOT cool) and thankfully I haven’t had to work too hard to exercise self-control. I don’t love it when people say things like “Oh my gosh, you’re STILL pregnant?” Or “no baby yet? ?” but I know they just don’t know what else to say, so I just smile and refrain for the sarcastic reply I’m thinking in my head. Really, this week has been a battle of the mind because I had myself convinced he would already be here. And honestly, if it weren’t for him being a little on the bigger side and me attempting to have a VBAC, I wouldn’t have any problems at all going past due date. But that’s where FAITH comes in. I have no doubt the Lord is continuing to grow our faith and teach us to trust in His PERFECT timing. My friends & fam have been super encouraging with their love, funny videos, verses, texts, and prayers. And Jesus Calling was right on with what I needed to hear for sure too. And I just have to say, Jonathan has been a ROCK. Even through a time of great sadness of losing his mom, he has been 100% there for me. He is not as vocal about his faith (like we’re often used to from our girlfriends), so sometimes I forget and take for granted just how faithful and what a prayer warrior he is. Any time I have felt the least bit discouraged or started to doubt, he has completely encouraged me and reminded me what the Word says. There have been so many encouraging Scriptures that have helped me feel at peace too & I just keep reciting them over and over when the doubt starts creeping in. Mentoring has been helpful in preparing me and teaching me that every thought we have is either based out of fear or faith, and we are choosing FAITH. I know the Lord has some big things in store for this little guy’s birth story and I can’t wait to share it with all of you…and give him ALL the glory for it!